Hard Cover, 288 pages, 8 x 10.5. 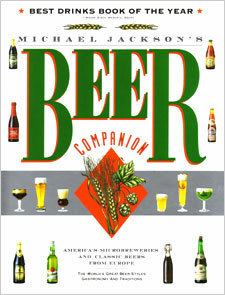 Here is one of Michael Jackson's cornerstone books, and one of the books that earned him the title of The Beer Hunter. Civilization began not with wine, but with beer, argues Michael Jackson. The world's leading writer on beer, Jackson has long championed beer as one of the great civilized drinks. Full of original insights and quirky observations, Michael Jackson's Beer Companion provides authoritative information on brews and breweries, as well as expert tasting notes and vivid travel writing. Like wines, beers have their own traditional styles, which form a universal vocabulary for beer tasting and appreciation. Jackson identifies 41 such styles and traces them from their European origins to areas as diverse as Seattle and Sydney. Ranging from hoppy British bitters to the dark lagers of South Germany, from the Classic Pilsners of Bohemia to the arcane fruit beers of Flanders, Jackson profiles more than 150 breweries as benchmarks of excellence. These are the great beers of the world, and among the old favorites is a wealth of new classics ripe for discovery. Jackson's infectious enthusiasm for his subject extends to the convivial partnerships between beer and food -- when beer is an accompaniment to an excellent meal, or a cooking ingredient itself. More than 200 original color photographs show us the brews and breweries, the landscapes and towns where great beers are made and enjoyed, the growing and harvesting of barley and hops, and many aspects of beer lore. Helpful locator maps pinpoint brewing regions. A gazetteer and a glossary complete the tour.